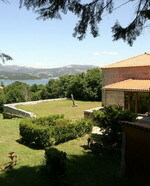 Lodging & Tours in Galicia - "Green Spain"
Visiting any of Galicia's major cities can be both enjoyable and educational. This part of Spain has a wealth of historic buildings ranging from Celtic forts and roman ruins, to Gothic and neo-classical architectural masterpieces. Many of the latter are religious buildings although many grand civil structures, from town halls to mansions, can also be found. Museums are also plentiful and popular and most have a regional or provincial theme to their exhibits. For a view of real Galicia, many would suggest a visit to one of the regions many coastal towns. Most of Galicia's towns are situated close to a bay or cove and were originally connected with fishing. The region has a long seafaring history and although other enterprises now prosper in Galicia, the fishing industry remains a large employer and economic contributor. With a population of only three million inhabitants, Galicia has plenty of open space and a drive into the region's interior serves up some breath taking scenery. Forests, meadow land, rolling hills and mountains, all populated with small villages, are on the menu. Galician tourism is however very much there for you to discover and help, in the form of guides and books, is limited compared to many other places in Europe. Buy at AllPosters.com Part of Galicia's allure to the tourist is certainly the appeal of visiting somewhere slightly off the beaten track. It is certainly true to say that Santiago de Compostela now has a cosmopolitan tourist trade, but most of Galicia's other cities do not and an English voice is definitely still a rarity. Cities like Lugo, Pontevedra, Ourense and the massive A Coruna and Vigo, have little in the way of foreign tourism and although British and American visitor numbers are on the increase, they are still small. This should not detour the tourist though, all of these cities have great visitor appeal and their inhabitants are generally friendly and helpful. The time of year to visit Galicia is definitely something to consider. The region has an extended summer that results in mild temperatures starting in April and running through to October. The best weather is normally reserved for June, July and August, although in this part of Spain clear blue skies are never under warranty. Visiting in the winter months will require the addition of warm clothing, weather proof jackets and certainly an umbrella. Galician tourism is not geared up for foreign speakers, so if you are English, American, German or French, you will have to pick up a few basic phrases, use plenty of courtesies and practice pointing and smiling a lot. As ever, if you want to buy something, get your money out, this normally helps make your request crystal clear. Getting to Galicia has become cheaper and easier over the last couple of years with major carriers flying direct to Santiago's international airport. Prices have also come down, particularly for those departing from the UK. Flying from the USA is still comparatively costly, but as visitor numbers increase costs will inevitably come down to match them. Car rental is pretty much essential for the Galician holiday maker. Galicia is a place to be explored and the best way to do this is independently with your own transport. If this is not an option, the other alternative is to book a tour. Coach tours are few and restrictive and are always limited to the major cities, or predefined routes. If you decide to opt for this type of holiday, make sure you know exactly what is on your schedule before hand and check to make sure you have adequate time at the main stop off points. About the Author - Webmaster for galiciaguide.com and part time writer about Galicia and its tourist attractions. Santiago de Compostela, the "European City of Culture" for the year 2000, is located in the northwest region of Spain in the province of A Coruña. It is the capital of the autonomous community of Galicia. The city's cathedral is the destination of the important medieval pilgrimage route, the Way of St James (in Spanish the Camino de Santiago), which is still walked today. The cathedral fronts on the main Plaza of the old and well-preserved city. Across the square is the Pazo de Raxoi (Raxoi's Palace,) the town hall and seat of the Galician Xunta, and on the right from the cathedral steps is the Hostal de Los Reyes Católicos, founded in 1492 by the Catholic Kings, Isabela and Fernando, as a pilgrim's hospice (now a parador). The Ribeira Sacra is an incredibly beautiful region of Galicia on both sides of the monumental canyon of the Sil. Mountainous territory with pronounced valleys, livestock, genuine gastronomy, and a splendid monastic past, makes it a compelling place to visit. The Hotel Balneario Augas Santas is located in the province of Lugo, Spain, in the centre of the Ribeira Sacra. It is one kilometre from the village of Ferreira de Panton, and 10 kilometres from the village of Monforte de Lemos. Situated in lush parkland, this modern hotel features a spa with therapeutic waters, hydrotherapy, heating therapy, massages, and beauty treatments. 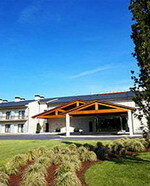 Other facilities include an outdoor pool with sundeck and an 18-hole golf course, while practical amenities include room service and wireless Internet access. Activities for children are available. The Augas Santas restaurant is modern and serves typical Galician, and Spanish dishes, accompanied by regional and Spanish wines. A complimentary breakfast is served to guests each morning. Business facilities include conference rooms, and a business centre. As well as an 18-hole golf course, there is a mini-golf course within the hotel grounds. 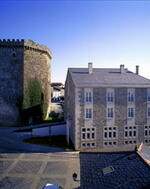 Vilalba - famous for its tower, the "Torre de los Andrade en Vilalba. The town is approximately 35 kms from the provincial capital of Lugo. The Husa Spa Villalba is a contemporary spa hotel which benefits from the thermal waters of the Lugar Alligal and is eight kilometres from the Spanish town of Villalba. 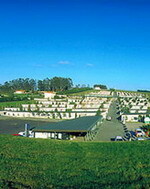 Guitiriz Golf Course is 30 kilometres from the hotel and Lugo Cathedral is 40 kilometres away. Alvedra Airport is 110 kilometres from the hotel, with an approximate driving time of 90 minutes. The Thermal Club has a thermally heated swimming pool, with counter-current river, geysers, water beds, spa tubs, and relaxation rooms Fitness equipment is available, and the hotel also has a sauna and massage treatment rooms. Restaurant Villalba serves local specialities in a contemporary setting. The 42 air-conditioned guestrooms are located over two floors and have contemporary decor and furnishings including desks. This impressive tower from medieval Galicia, now converted into a hotel, dominates the landscape of this town, centre of the "Terra Chá" area, which originated from this fortress, home of the Andrades, the counts of Vilalba. The hotel offers cosy, welcoming spaces with a medieval air; in the tower, 6 bedrooms share this medieval style with the Salón de los Andrade, with frescos and coats of arms. 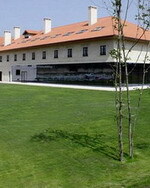 In the shadow of the tower, the new stone building is in the style of a pazo, the Galician country house, housing the remaining 42 bedrooms, the restaurant and bar. Lacón con grelos (ham stew with greens), Raxo pie, beef kebab Don Nuño, roscón de Vilalba (local cake), San Simón cheese... And at Christmas time, the star of the table is a Vilalba capon, roast in the medieval style. Hungry yet? Pazo da Trave is located on the coast of Lugo in Galdo, Spain, in a valley 3 kilometres from the Ria de Viveiro. Viveiro town centre and its train station are 3 kilometres away. Pazo da Trave is set in a stately stone country house, formerly a medieval palace, surrounded by a garden shaded by Galician trees, and featuring a small chapel. There is an outdoor pool surrounded by greenery, and fitness equipment is available. Multilingual staff at the front desk can secure valuables in the safe-deposit box, and complimentary newspapers are provided in the lobby. Pazo de Trave Restaurant has a dining room with exposed timber frames and a glass-enclosed arbour. Traditional dishes from the Galician region are served for breakfast, lunch, and dinner. A sandy playground is available for children and the hotel can organise activities such as paintball, surfing, cycling, and learning activities. There is also a reading room featuring a fireplace. 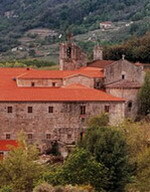 Leiro - In the Ourense Province of Galicia - inland town with beautiful mountainous scenery and historic areas. The remote hillside village of Leiro is eleven kilometres from the historic village of Ribadavia, 16 kilometres from Arnoia Spa, and 30 kilometres from Ourense. The Santiago de Compostela Airport is 110 kilometres. The Monumento Monasterio is a picturesque 12th century Cistercian monastery combining Baroque and Renaissance cloisters in the remote hillside village of Leiro, eleven kilometres from the historic village of Ribadavia. The hotel is 11 kilometres from the historic village of Ribadavia, 16 kilometres from Arnoia Spa, and 30 kilometres from Ourense. The Santiago de Compostela Airport is 110 kilometres. Guests can relax by the pool or explore the historic grounds and buildings that make up the monastery. Among them guests will find conference and banqueting facilities for up to 235. Restaurante San Clodio offers and extensive à la carte menu fusing traditional local dishes with nouvelle cuisine in relaxed rustic surroundings. Those keen to explore the surrounding area can get local information and advice from the hotel's concierge desk. The 25 guestrooms have a separate seating area with doors leading to balconies. 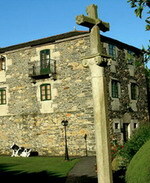 The Pazo Almuzara Guest House is located in Boboras, Spain, 50 kilometres from the Amanteira Monastery. Ourense is 25 kilometres away and includes a cathedral and the Bellas Artes Museum. Leiro is 6 kilometres away from the guest house. The guest house has a swimming pool in the gardens and complimentary Internet in the public areas. There are express check-out and check-in facilities. There is also onsite complimentary parking. 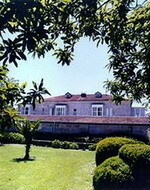 Pazo Almuzara Guest House serves a continental complimentary breakfast in the dining room each morning. The 19 guestrooms have televisions, DVD players, and complimentary Internet access. The telephones offer free local calls and the guest house provides complimentary bottled water.